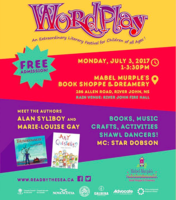 This year, the children's festival WordPlay takes place in conjunction with the grand opening of Sheree Fitch's dreamy new venture, Mabel Murple's Book Shoppe and Dreamery, on July 3 in River John, NS, with Alan Syliboy, Marie-Louise Gay, and plenty of celebration. From July 6-9, the Elephant Mountain Literary Festival ("Arguably one of the most beautiful lit fest locales going," according to the Toronto Star) in Nelson, BC, features authors including Leesa Dean, Lee Maracle, Joy Kogawa, and more. Read By the Sea returns to River John, NS, on July 8, with Christy-Ann Conlin, Lesley Crewe, Dean Jobb, and Terry Fallis. From July 13-16, The Saskatchewan Festival of Words takes place in Moose Jaw, SK, featured authors including Marty Chan, Dawn Dumont, Marina Endicott, Anosh Irani, Jael Richardson, Alissa York, and more. The Lakefield Literary Festival runs July 14-16 in Lakefield, ON, (near Peterborough), with a line-up including Zoe Whittall, Marni Jackson, Lynne Katsukake, Jane Urquhart, Kerry Clare, Douglas Gibson, Steven Price, Lindy Mechefske, and children's events with Andrew Larsen and Kari-Lynn Winters. The program also includes Craft Talks for writers. The Winterset in Summer Literary Festival in Eastport, NL, takes place August 10-13, with Anakana Schofield, Esi Edugyan, Elisabeth de Mariaffi, and so many more great authors. A few tickets are still left for the very popular When Words Collide in Calgary, AB, August 11-13, with Will Ferguson, C.C. Humphreys, Guy Gavriel Kay, and others. The Writers at Woody Point Festival in Bonne Bay, NL, runs August 15-20, with authors including Eva Crocker, Dennis Lee, Lawrence Hill, Linden McIntyre, Lisa Moore, Kathleen Winter. 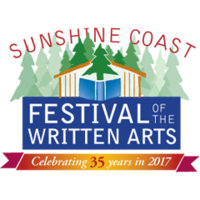 And The Sunshine Coast Festival of the Written Arts returns August 17-20 to Sechelt, BC, for its 35th year, its amazing lineup including Donna Morrissey, Iain Reid, Janie Chang, Kamal Al-Solaylee, Bev Sellars, Zoe Whittall, Charlotte Gray, and more. Have we missed anything? Email *editor at 49thShelf dot com* to have your event added to the schedule.